Our church honors her memory on July 7th. She was from Nicomedeia of Asia Minor. Her parents, Dorotheus and Euseveia were devout Christians. Their home was changed into a “home-church” where they held Christian meetings and prayers. In Dorotheus’ and Euseveia’s blessed life there was a deep pain: they had no children. God, however, to certain couples He sends children, after many fervent prayers, tears and sighs, and to others He does not, so that they may raise, aid and adopt babies, orphans,poor and unprotected children. This is an inexplicable mystery. Dorotheus and Euseveia were praying for God’s will to be done. The Most Good Lord, after that trial gave them a little daughter. She filled their home with joy. They named her Kyriaki because she was born on the day of the Lord. She was raised with particular care and from her earliest days her pious parents installed in her infant soul the faith, love and reverence of God. This is what the present-day parents must do, also, if they wish to be, later on, proud to be the parents of holy and respected children. The modest and humble daughter listens to the wise advice and counsel of her parents and as she grows up her Christian virtues become evident at home and at large. 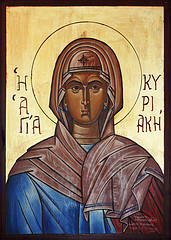 Kyriaki becomes-the sister of all the suffering people. All admire her untiring fortitude in her care for them. Suddenly the peaceful life of Dorotheus’ family is shattered. A young, rich, pagan man, seeing her physical beauty wishes to marry her, not knowing that she is Christian. Kyriake rejected him with these words: I am the bride of Christ. The frustrated young man denounces the whole family to the Provincial Governor. The Governor called them all to a hearing. First the parents confess their Christian faith, choosing to ignore the tortures. The Governor ordered them to be tortured and killed in the presence of their daughter, in the hope of swaying her. Kyriaki does not budge; she refuses to sacrifice to the idols. After whipping her they throw her into prison. Several days later she was sent to the Governor of Bithynia, Hilarianus, well known for his cruelty. When Hilarianus saw Kyriaki with her bright face and beautiful bearing, he attempted to lure her into sacrificing to the false gods through sweet words and promises. Kyriaki was adamant. I am a Christian and I wish to die a Christian. She kept repeating. Hilarianus ordered to torture the maiden. Her flesh was cut by sharp knives and the flames of torches were adding to the agony. To no avail; after a long time even the torturers threw away their instruments of pain in frustration. The public was amazed at the maiden’s courage and heroism, so the Governor put her once more to jail. In jail, an Angel of the Lord appeared to her and healed her wounds and armed her with more courage. In the morning, when Hilarianus saw the miracle that had taken place,instead of repenting for his inhumane acts and believing in Christ, or, at least, free Kyriaki, he ordered her to be beheaded. Kyriaki asked her executors to allow her to pray before they kill her. As soon as she finished praying, an Angel of the Lord received her spirit and the Christians took her body and buried it. The Paphos church with 4 names. . . . He tenido la suerte de poder conocer el lugar sagrado donde realizan su labor diaria y maravillosa. Les quiero solicitar que dentro de sus oraciones por favor lo tengan en cuanta a Roberto Mónaco el cual esta con cancer y esperamos con fe que se recupere.